The next time you see the idol of the goddess, remember, it is no less a symbol of oppression. 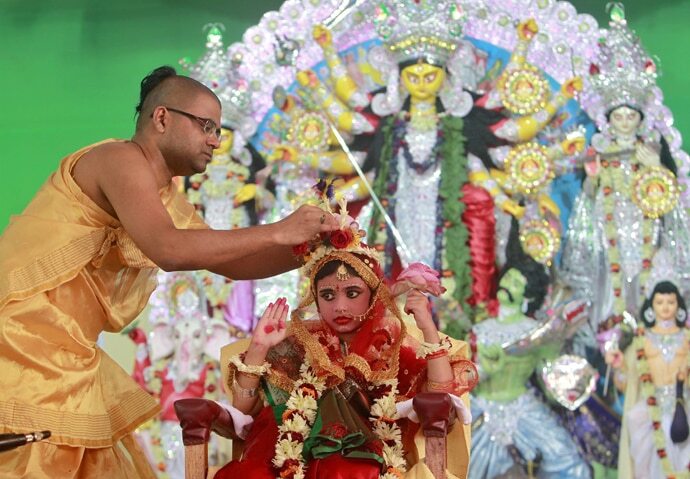 For every Bengali, anywhere in the world, the Durga Puja is special. 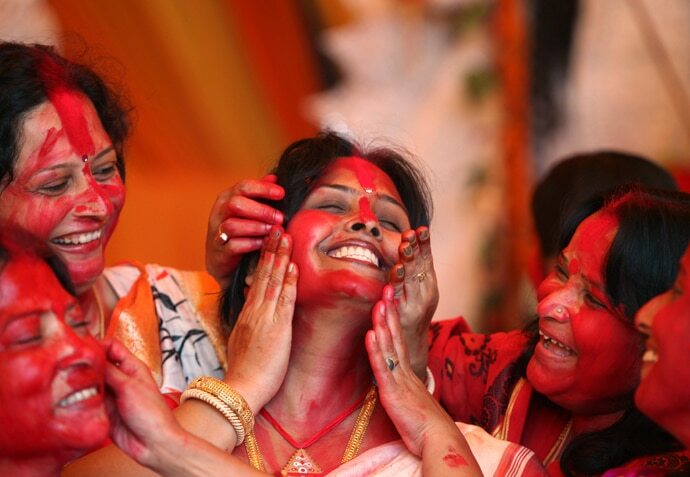 It is an occasion for unbridled joy as the mother goddess comes visiting and every effort is made to ensure that her brief sojourn at her "natal home" is as memorable as it possibly can be. It is a time for new clothes, new relationships and new resolutions; for dance, music, delicious food and adda (loosely translated as gossiping - that favourite pastime of the Bengalis). It is as much a social event as a religious one: an occasion to catch up with friends and family; an occasion that celebrates togetherness far better than what can be achieved, for instance, through Facebook or Skype. The energy with which it is celebrated is something one has to see to believe. The priest performing an aarti of the goddess and dancing himself into a trance to the heady beats of the dhaak (traditional drums), with smoke from a thousand incense sticks creating a veil around the place is one of the most abiding images of the Durga Puja that you can have. It is surreal. It gives you goosebumps. It also, importantly, marks the victory of good over evil, with the ten-armed warrior-goddess riding a majestic lion vanquishing the vicious buffalo demon (Mahishasur). It is all about symbolism and it calls on us mortals to have faith in god to dispel all our troubles, and all misfortune the way she destroyed the evil demon. The Durga Puja, therefore, is special indeed. Or, is it really so? 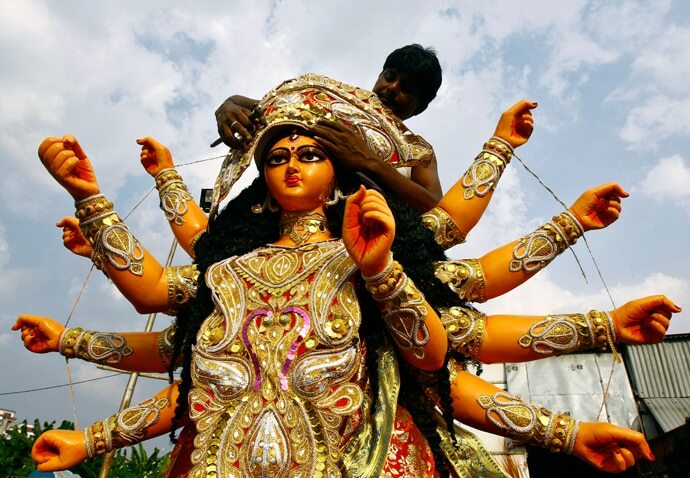 Is the Durga Puja all good and glorious, or does it have a darker side to it? Does it have a diabolical agenda, that is expertly concealed? Let's put the "goodness" of this popular festival - an unmistakable element of dominant culture - to test. 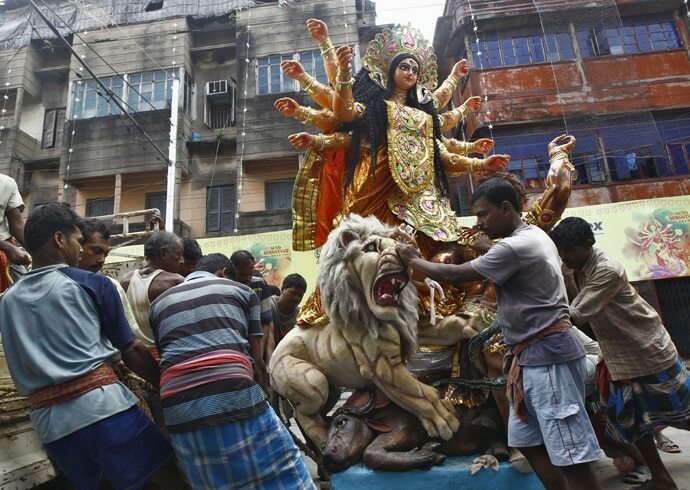 To understand the politics of the Durga Puja, we may start from the idol itself. The goddess is fair-skinned (and hence, beautiful) and embodies all the virtues of life and is shown as slaying a demonic half-man-half-animal creature who is placed at her feet. So their lands are taken away from them, they are displaced from their forest abodes and their cultures undergo forced transformation. A recent study showed that in the last 50 years or so over 200 indigenous languages have become extinct in India. Contact with the mainstream population, though is expected to deliver the fruits of development and modernity to the adivasis, can also have deleterious effects and activists fear that it may expose the adivasis to diseases which they have never known of, and to which they have grown no immunity. The dominant culture, on a civilising mission, prescribes methods through which the adivasis can "upgrade" their lifestyles, so that they can be mainstreamed. Indeed, assimilating into the dominant culture is perhaps the only way in which the adivasis can save themselves from violence in their lives. That is what Prahlad and Vibhishan did, for example. Both of them were born in demon clans, but realised that their deliverance depended upon accepting the mastery of the cultural hero. Thus while the former was a devout worshipper of Lord Vishnu, the latter submitted to Lord Ram (an incarnation of Lord Vishnu), thereby upgrading their lives, and hence were assimilated into the dominant culture with due dignity, and could save themselves from the violence that the rest of their kin suffered. Coming back to the symbolism inherent in the Durga Puja, the fact that the goddess kills the demon is what meets the eye. But what does not readily is perhaps that Devi Durga not only slays the physical form of Mahisasur, but perhaps also the vices that the demon possesses. It is almost a purification ritual that an adivasi has to go through to be assimilated into the mainstream. Moreover, the good versus evil narrative that is at the heart of Durga Puja is also problematic. 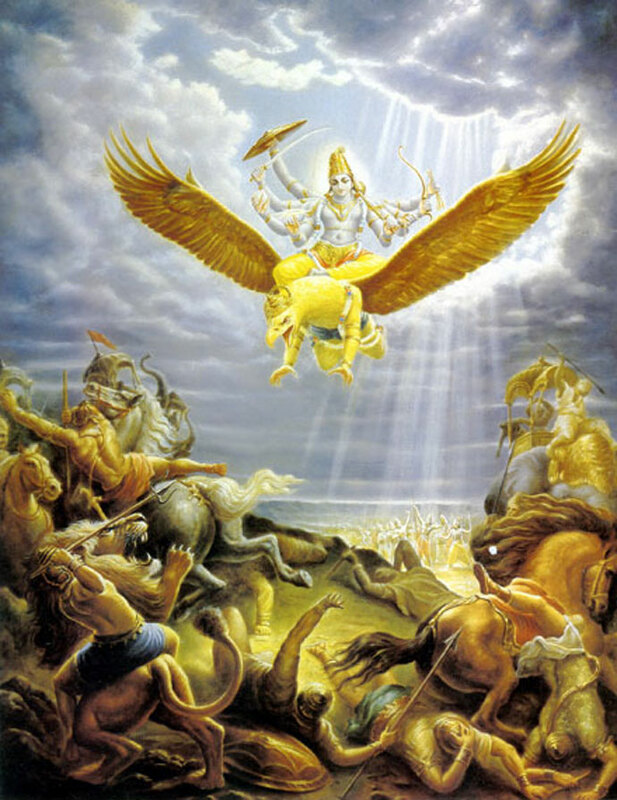 Mahishasur may have had his reasons to wage war against the gods. Who is to say that those reasons had lesser weight than those of Durga? Didn't the gods cheat to deprive the demons a share of amrita (nectar of immortality) following samudra manthan (churning of mighty ocean)? Why? Was it because the gods thought that had the asuras become immortal, they would have caused mayhem and destroyed the moral fabric of the society? If so, were the gods any better? When Indra, the king of gods, seduced Ahalya, the wife of sage Gautama, where did all the morality vanish? He was cursed by the enraged sage but was later freed by none other than Lord Shiva. Isn't it the height of partiality that Indra's offence is forgiven, while Mahishasur had to pay with his life for dislodging Indra from his heavenly throne? Who knows, Mahishasur could have made a better ruler than Indra. This narrative in itself may be seen to reside merely in the realm of mythology, but the symbolism involved renders it socially salient. It shows that once a group of people comes to possess a degree of power, they try to cling on to that power, the abilities of their leader notwithstanding. In any battle, each party believes that s/he is fighting for justice. What may be right or just to one may be wrong or unjust to the other and vice versa. It is very difficult to take sides. However, the fact that we have all too easily accepted Mahishasur as the vile villain and Durga as the ultimate heroine reflects a lopsided cultural education. It also shows the imprint of dominant culture on us. It seeks to project one line of thought as the truest, while belittling the others and even identifying some of them as "enemy" cultures. Thus for the devas (gods), the asuras and rakshasas (demons) were part of an "enemy" culture that is to be subjugated, and vice versa. What a dominant culture also does is to find ways to perpetuate its dominance. This is achieved with the help of an ideology that gives the dominance a degree of legitimacy. Thus elaborate narratives are constructed that are then accorded the sanctity of religion. It is in this light that the narrative around the Durga Puja is to be interpreted. So the belief systems of people come to reflect the power structure prevalent at a particular point of time, and ensures the continuation of that structure. The Durga Puja celebrates the perpetuation of pre-eminence of a certain category of people and establishes beyond doubt that whenever there emerges voices of dissent, they have to be quelled for the sake of social well-being, and indeed it is done by unleashing on the dissenters the great powers of the universe (in the form of either Lord Shiva, Lord Vishnu and his many incarnations, or Devi Durga). But what about Kali? She is dark-skinned and still a mainstream goddess, is she not? Importantly, she is considered to be a manifestation of Adi Shakti, and here comes the politics behind this representation. It could well be that a tribal deity had got assimilated in the mainstream Hindu culture and got its importance only in so far as the mainstream Hindu culture would allow it its space, with the condition that the latter would have to do the bidding of the mainstream Hindu culture. Kali, therefore, is considered to be a manifestation of Adi Shakti. Kali is therefore not the main deity, but one which relies on the main deity for its existence. Durga is also a manifestation of Adi Shakti, but the assimilation and subordination of the "little culture" by the "great culture" does not come across as profoundly in the case of Durga as in the case of Kali. This subordination is sought to be institutionalised by putting the stamp of religion on it, and once anything becomes part of people's faith, it is very difficult to dislodge. Karl Marx had famously said that religion was the "opium of the masses" and he was perhaps right. The Durga Puja, therefore, is not simply about devotion and worship, but about a dark power play. One may contend that according to tradition, the first lumps of clay for making Durga idols have to be collected, among others, from the doorstep of a prostitute. Isn't that a symbol of inclusiveness? However, it might well be a mask to conceal the reality. So the next time you see a Durga idol, remember, it is no less a symbol of oppression, and the next time you immerse yourself in the celebrations, ask yourself: Are you not being a party to that oppressive cultural system?